Regarding the Dojo Kun...the five precepts of Shotokan Karate-Do, as well as many other karate styles. My understanding is that these five sayings come from a far more volumnous Coda of Confucius' sayings related to ethical behavior (kind of like Proverbs). The founder, needless to say, was a scholar in many areas and like much of the Okinawan gentry, was very knowledgable in Chinese writings. In fact, beyond the five, some karate schools will incorporate Funakoshi's expanded list of 20 favorite sayings. Let's say that the founder, Master Funakoshi, thought enough of these five rules to have students say them at the end of class, but more importantly, to incorporate such actions into their daily lives. 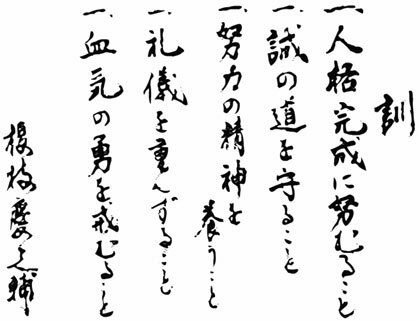 It's probably accurate to say that most Shotokan schools recognize and recite these five rules of life that the founder thought most important in the practice of this art...I find the Dojo Kun to be totally compatible with our Christian way of life. Seek perfection of character --- Note that it emphasizes "seek", which doesn't mean that perfection can ever be attained, just that it's a worthy, lifelong pursuit. It also doesn't say perfection of technique, it's really a good inner person that we're trying to become. Be faithful --- I used to think that this meant to be faithful to something, your karate style, your sensei, etc. Nowadays, I think it really means to HAVE FAITH. To have faith in Him, that the path He's chosen for you will lead you to better things. Path, incidentally, is one of the meanings for the Japanese word, Do. Karate-Do, indeed, implies the practice and incorporation of karate principles as a way or path in life. Endeavor --- This obviously means to keep on trying. I like to think about the opposite side of it, which is...never quit. In all of my years with karate, I've seen people who totally love the art, people who can't stop thinking about it, people who train 7 days a week for years and then burn out, I've seen people reach very high levels of conditioning and excellence only to get injured or raise families or get consumed by their careers and never come back, I've seen competent black belts forget all of their katas (including the Heians) after several years absence. Yet, despite all of life's seasons and unavoidable interruptions, if one can continue to devote a small part of their life to continued training, nothing of importance from karate-do is ever lost. Respect others --- When one first starts karate, it's so easy to respect everyone in the dojo/ministry, from the sensei down to the sempai sitting to your right. Everyone seems to be able to do wonderous things that you want to learn. This message really hits home to senseis and sempais. We should really accord respect to everyone, not based upon their knowledge or strength. I believe that this begins with the most basic respect....respect for oneself. I don't mean just the idea of loving oneself. I mean the old saying..."No self-respecting person would..." In other words, having enough respect for yourself to always strive to do the right thing. Once you're secure in your respect for yourself, respecting everyone else is a natural thing. Refrain from violent behavior --- Finally, the only part of the Dojo Kun that talks about action! And what it says to refrain from impetuous action. Actions or behavior that springs from uncontrolled emotion (anger or fear being most common). If one trains long enough, karate grants a person tremendous power, which, like a sword, needs to be sheathed except in the most extraordinary circumstances. Most of us think that we come to karate to learn to punch and kick (at least, I did) and actually, that is the least of the reasons that He really calls us to the Do. Well, just wanted to ramble for a few minutes on the Dojo Kun. Hopefully, when we recite the Kun, it won't be totally a mindless exercise.